You have the desire to be a profession-ready lawyer. You want to learn from world-class faculty-mentors who are recognized thought-leaders in their fields. You’re ready for the Power of Orange to transform your future. Then the Online J.D. program at Syracuse University College of Law is for you. ABA-approved and offered by a fully accredited law school, you can request more information about this real-time online law program by emailing JDOnline@law.syr.edu. 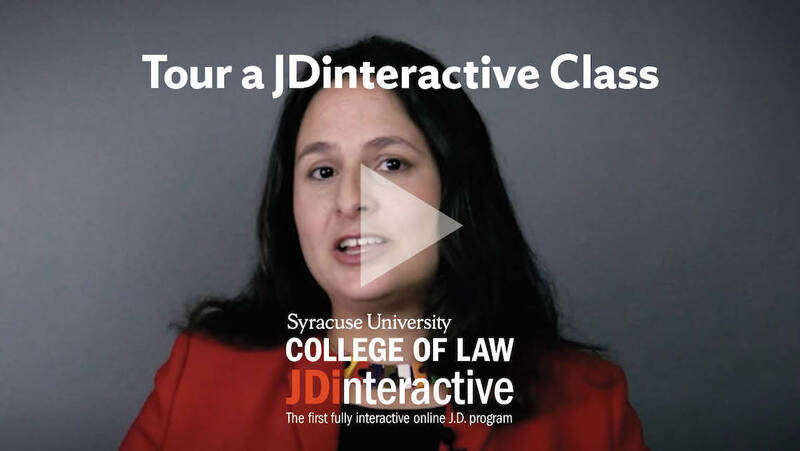 JDinteractive is taught by Syracuse University College of Law faculty to the same high standards as the residential JD program. JDi is an ABA-approved flexible law degree option designed for talented students who cannot relocate to law school because of work or family commitments. The program combines real-time, live online class sessions with self-paced instruction, on-campus courses, and experiential learning opportunities. Each course blends real-time, live classes and self-paced lessons. Online law school students earn the same degree as they do on campus. The College’s distinguished faculty design and teach the courses. Admissions standards mirror those in Syracuse’s residential program. The part-time structure offers JDi students a flexible schedule. In-person residencies connect students with College of Law professors, our Syracuse campus, and other Syracuse students. JDinteractive is a technological innovation in legal education, but the fundamentals will stay the same. They will always be at the heart of Syracuse’s law school curriculum. Online law school program students complete externships. These offer opportunities to earn academic credit while gaining real-world legal experience under the supervision of a practicing attorney. Students can join the student-run Syracuse Law Review and other student interest organizations. Students taking a Syracuse law degree online have access to student programming and services. These services include academic counseling, student support, tutors, study groups, bar exam preparation, and professional development. JDinteractive students are offered full career support services. These career services include instruction related to job application materials, résumé review, mock interviews, and more. One of the immediate advantages of hybrid and online programs is the flexibility they allow, as flexibility begets access. Syracuse … may now become an option for a talented student for whom the opportunity and other costs of a residential program would have been too high even to consider. Syracuse University College of Law is pioneering one of the nation’s hybrid JD programs, available for enrollment in 2019, and others are looking into the potential advantages of this type of offering, particularly as the post-secondary student body grows in non-traditional, mid-career adults seeking credentials from flexible programs. Founded in 1895, Syracuse University College of Law offers students a forward-leaning legal education. It is designed to ensure that graduates have the knowledge, discipline, and analytical skills to succeed in the 21st-century legal profession and related fields. To study the law is to join the ranks of some of the best minds in history. You join leaders, idealists, inventors, entrepreneurs, dreamers, agents of change, heroes. This is the tradition you enter at Syracuse University College of Law. We believe an outstanding legal education is as dynamic as the law itself. Syracuse puts you at the center of an intellectual, professional, personal, and cultural experience. It is an experience that will make you a better lawyer and a better leader. The College of Law sits at an enviable position for law schools. Syracuse is rigorous, intimate, and friendly. Your mentors are faculty known for extraordinary teaching who also happen to be thought-leaders in their fields. Ranked among the best in the country for our trial and appellate program, Syracuse is also a leader in emerging ﬁelds such as disability law, national security law, and technology commercialization. From big law ﬁrms to solo practice startups, from clerkships to public advocacy, from international banking to Capitol Hill to Hollywood studios—the knowledge, practice, and network you find by studying at Syracuse is an incomparable experience and education designed to endure.